Sitch Radio - Community Internet Radio Station for Podcasters Globally! Get that idea for a show out of your head and on Sitch! What day do you want Your Show? This is a comprehensive discovery workbook that will walk you through some of the questions you will need to have answers for before you start a podcast. 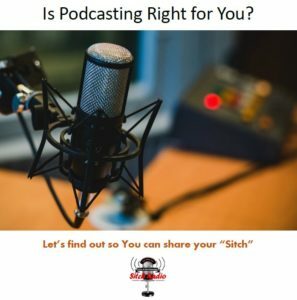 If you are serious about starting a podcast download this workbook and complete it by answering the questions on the last page.
" The Podcaster's Lounge "